"Renowned from olden times for his great love and faithfulness to his master." but a strong deterrent to criminals, you may want to take a look at the Boxer. The Boxer gets its name from its habit of using its front legs to box when it is fighting. These powerful dogs were originally used as hunting dogs, although they quickly became popular as police and military dogs in Europe. As people began to discover how devoted and loving the Boxer was to its family, this dog breed turned into a companion dog, as well. Although Boxers are considered to be medium sized dogs, they have the strength of a big dog. Interestingly enough, the versatile Boxer dog breed didn't become popular in the United States until men returning from fighting in World War II brought some of these dogs home with them. A young, healthy Boxer is all muscle and energy and weighs in at fifty to eighty pounds. These dogs have a broad chest, a wide skull and a face similar to that of a Bulldog. Their big brown eyes are very expressive and these dogs are not above using a pitiful 'poor me' look to get their own way. 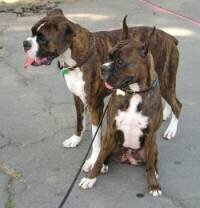 The Boxer dog breed should be fawn or brindle with black mask like markings on their face. A dog with white markings is considered to be flashy. However, if a Boxer has more than one third of its body covered in white or is completely white, it will be unable to compete in the show ring. Also, white Boxers are prone to deafness, as well as other health problems. If you live in an apartment, a Boxer may not be the right breed for you. These dogs are high energy animals and really need to be able to exercise frequently. A home with a securely fenced yard is ideal for a Boxer. You will need to be sure the fence is high enough and secure enough to prevent your dog from escaping, since a Boxer can easily jump over lower fences. 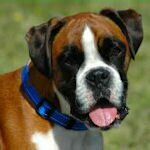 Although most Boxers get along well with other dogs, you may not want to buy a Boxer if you have a small dog or cat. If you do have other dogs, consider neutering your Boxer at six months to keep aggression toward other dogs in check. Small children and Boxers get along quite nicely, although your Boxer may be too energetic to play with toddlers until he matures. After all, a young, exuberant Boxer can easily knock an adult flat with an overly enthusiastic greeting! Since the Boxer dog breed is so high energy and so powerful, these dogs need to be enrolled in obedience training while they are still easy to control. Puppy classes can also help you socialize your Boxer and will teach him to play nicely with other dogs. 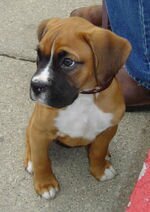 Boxers are eager to please and should pick up basic obedience commands quickly. You may want to consider advanced obedience and agility training for your Boxer, as well. Boxers require very little grooming. Simply brush through your dog's sleek coat once a week to remove loose hair so you don't have to vacuum it off of your floor. Boxers are hearty eaters. You should consider feeding your dog a food formulated for large dogs, since Boxers are prone to hip dysplasia. These dogs have relatively few other serious health problems. You may want to check for a history of heart or thyroid disease before buying a puppy. You should also clean your dog's teeth and check his nails to see if they need to be trimmed. So, if you want a dog who will be a devoted friend and companion, then the Boxer dog may be the perfect choice for you. 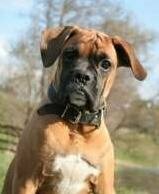 Dog Breed Family The Boxer belongs to the family known as the Guard Dogs group. The boxer is a German developed breed of stocky, medium-sized, short-haired dog, with a smooth fawn or brindled coat and square-jawed muzzle. Boxers are brachycephalic, and have mandibular prognathism (an underbite), very strong jaws and a powerful bite. The Boxer were bred from the Bulldog and the now extinct Bullenbeisser and is part of the Molosser group. The boxer was first exhibited in a dog show for St. Bernards at Munich in 1895, the first boxer club being founded the next year. Based on 2006 American Kennel Club statistics, Boxers are the seventh most popular breed of dog in the United States. A position they have held since 2002with approximately 35,388 new dog registrations during the year.